This is a rules file for Zillions of Games, a Windows program that will let you play any puzzle or strategy board game you can feed it the rules to. With Zillions-of-Games installed, this rules file will let you play this game against your computer. This zip file contains updated version of ZRFs (Zillions files) for the modern-variant of Chaturaji (4-handed Chaturanga) without dice. This implementation is based on "4-handed Chaturanga with dice" Zillions implementation from Mats Winther, February 2006. This game is very strategic, and you'll enjoy playing at 2, 3 (2 vs 1+1) or 4 players. This new version allow "pass move" only when no other move is possible. 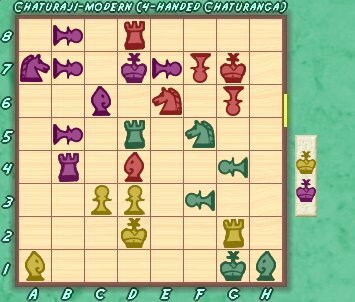 There's also new graphics, and enhanced computing (1-2 minutes for the computer [ 1xCPU 1800MHz ] is enough for a good game)..
Chaturanga for four players (called Chaturaji by Pritchard in his Chess Variants Encyclopedia) probably originated in India about 1000 years ago, and is believed to be a development of 2-handed Chaturanga. In medieval times, the game was mostly played with dice (four-sided long dice), often with stakes involved. This version without dices is an implementation of the modern variant (played in several parts of India until the end of the 19th century) whereas some options are not clear (no move after king captured and no 2nd King, piece promotion, king entering an attacked position...). The options I chose are for a better play, according to me. The four players form two teams of two players. Red plays together with yellow, and green plays together with black(=viollet). The king, rook, and knight move as in orthodox chess. Pawns, too, move as in orthodox chess, but have no initial double move. The boat jumps two squares diagonally. The first team that has taken both opponents' kings wins the game. 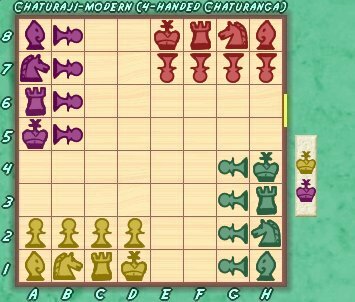 A player can not move his pieces after his own king is captured (no 2nd life for the king), and its pieces are no more attacking. It is not possible to capture one's partners pieces, allied pieces are not attacking themselves. A king cannot move into an attacked position (but any piece can move while its king is/become attacked). Pawns promote to any of: rook, knight, boat. A player can Pass its turn anytime only when no other move is possible. Note that, sometimes, it is possible to put one's own piece 'en prise', provided that one's partner has the intermediate move, so that he can remove the threatening piece. It is a common tactics to put a piece on a threatened square, assuming partner will attack opponent's King. It is a highly cooperative game. In this implementation, like in orthodox chess, king is a passive piece, not able to enter an attacked position. You'll play Yellow+Red or Black+Green, and if you want to play only one army, then use ctrl-H at partner's turn. It is fully playing with partnership, so that sometimes you won't understand a move at first sight. You'll lose some important pieces while capturing an opponent's King, that makes the game more equilibrate after capture. Try to place quickly your King in a not-attackable position, and to always keep an attack move towards opponents' Kings... This is the winning Key. Chose at least 1 min reflexion time for computer. This is a very fast and aggressive game. You'll find some sample plays in root directory of zipped Zillions files. Unfortunately, previous version gameplay are no more compatible with this version of ZRF. Be sure you have the "Use folder names" checkbox checked when you extract the files.